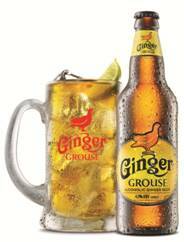 Ginger Grouse, a new and adventurous breed of alcoholic ginger beer is now available across the whole of the UK. Launched by the makers of The Famous Grouse in Scotland last September, Ginger Grouse is now winging its way south. The premium alcoholic ginger beer (4.0% ABV) combines the refreshing taste of ginger beer with a splash of The Famous Grouse whisky, citrus notes and warming spice for a completely new taste adventure. With a distinctly retro bottle design and bespoke glass tankard, Ginger Grouse has had the Scots flocking to sample this exciting new brand, which is available in 500ml bottles as well as on draught in selected outlets. This is the first time that an alcoholic ginger beer has been available to buy on draught, from retro-designed fonts at the front of bar. Ginger Grouse has followed in the footsteps of The Famous Grouse by becoming the new ‘Spirit of Scottish Rugby’, signing a three year deal this January. The Ginger Grouse Bar launched at Murrayfield for this year’s RBS 6 Nations tournament, with fans heading along to the match able to enjoy a bottle of Ginger Grouse before, at half time and after the match. Ginger Grouse is planning for a successful launch, targeting all major supermarkets and retailers (RRP £2.20) and 4,500 pubs and bars across the UK which will be supported by a large scale marketing campaign including TV advertising and in bar sampling. Ginger Grouse will be available in Asda nationwide from the end April with further stockists soon to be confirmed. Find Ginger Grouse at facebook.com/gingergrouse.